It is recorded that the climate aberrations were especially felt in the American Northeast, the Canadian Maritimes and in Northern Europe. In May that year, frost killed off most of the planted crops, then in June, two large snowstorms, one of them dumping 10 inches of snow in Maine, swung the final blow on that season’s farm crops. The cold dismal weather continued throughout the summer, however. In July and August, ice was observed on lakes and rivers as far south as Pennsylvania. They said rapid and dramatic temperature swings were common, with thermometers rising to above-normal levels of 95 degrees, Fahrenheit, and then dipping to near freezing within hours. The cause of this odd weather is believed to have been the eruption of a single volcano in the Indonesian Islands the year before. Mount Tambora, a stratovolcano in the island of Sumbawa, literally exploded on April 10, 1815, becoming the most violent volcanic eruption in several hundred years. It was more powerful than even Krakatoa, which gained much more attention after it blew out an entire island and killed thousands of people for hundreds of miles around in 1883. Because it occurred in such a remote part of the then-known world, the Tambora eruption was hardly noticed by people in Europe and North America. But it took its toll in the area where it happened. The eruption lasted for only five days, but it released roughly four times the energy of the Krakatoa blast and ejected an estimated 100 cubic kilometers of volcanic ash high into the stratosphere. The explosion left a caldera measuring four miles wide and reduced a 13,000-foot high mountain to only 9,000 feet. Tambora, a city of an estimated 10,000 people, was buried under the tons of volcanic ash. The eruption caused an estimated 88,000 deaths throughout the region. All of that volcanic soot drifted around the Earth and reduced the warming rays of the sun the following year, thus causing the dramatic weather changes. Tambora is among a rim of very active volcanoes that exist throughout the Indonesian chain of islands. There also is an active “rim of fire” that circles the Pacific Ocean that includes many very active volcanoes along the West Coast of the Americas and the Eastern rim of Asia. 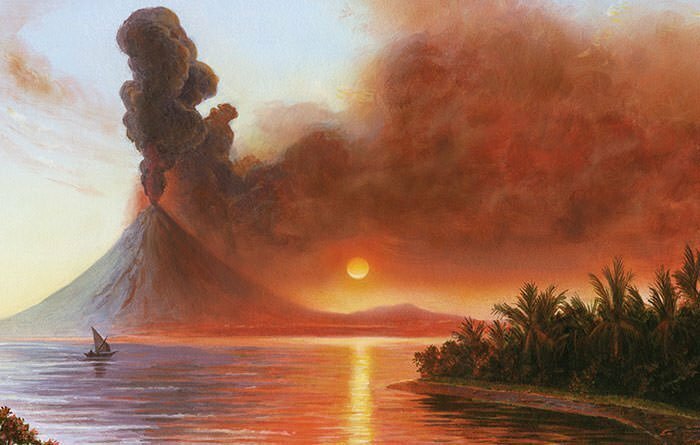 While the Tambora eruption is the largest in recorded history, geologists say it was dwarfed by some prehistoric eruptions. These include the largest eruption since humans have been on the planet. This occurred about 75,000 years ago on the island of Sumatra at what is now Lake Toba. This volcano caused mass extinctions and science says there is DNA evidence that the number of humans left alive were reduced to a few tens of thousands. They say an eruption of that size occurs somewhere on Earth every few tens of thousands of years. The Tambora eruption had an interesting effect on the art world in 1816. The cold wet weather forced Mary Shelley and her artist friends to stay indoors for much of their Swiss holiday that year, during which time Shelley wrote her famous book, Frankenstein. Her friend, John William Polidon penned The Vampyre. And the spectacular sunsets that year were recorded in the paintings of J.M. W. Turner.